Google announced they are attempting reach further into the social networking arena with the launch of their new +1 feature. So, what is this +1 feature and how does it effect churches? The +1 is simply a little button next to every listing in the search results that you can click to say you liked the page listed. If you 1-up (I’m coining that phrase) a listing, then the people you are socially connected to will see that the listing has been 1-up’d by one of their friends and it’s like getting a recommendation from a friend. The +1 will be rolling out in search listings first and then Google will make widgets that can be added to pages, so people can recommend a page while they are on it just like they can Facebook Like a page now. How does this effect churches? We talk a lot about search marketing here at Church Marketing Online. The whole idea of search marketing is getting your church’s search listings to the top of the rankings so more people find your church when they are searching. With +1 you have one more way of getting people’s attention. If everyone in your congregation 1-ups your church’s site, then all their friends and family will see a +1 recommendation when they come across your church’s search listings. Consider all the social connections your congregation has. It may be close to your entire town. So, just about everyone in town may start seeing your church’s listing as recommended. 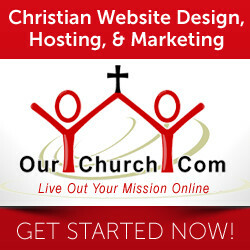 That’s one more thing to entice people to click through to your church’s website. Who knows, it may even be enough of an enticement to overcome lower search rankings. Right now there is no indication that 1-up’ing a listing effects search rankings. It just highlights that listing wherever it appears in the search results. But, who knows. Google may eventually work it into their algorythm. You can read more about Google’s +1 launch at Google’s +1 announcement blog post. What’s your reaction to +1? Do you think it’s something worth doing? No reason not to give it a shot. I did notice, though, that +1 doesn't appear to be next to local listings. As it's just being announced and will be rolled out in segments, I'm sure we'll see a lot of developments with this over the coming months. If it works well, I would expect to see it in the local listings too, though there already are reviews and ratings in the local listings.